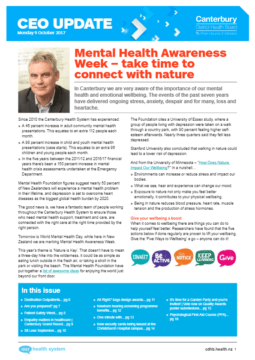 In this week's CEO Update, Chief Executive David Meates urges people to take time to connect with nature to mark Mental Health Awareness Week. We encourage people to get prepared in the event of disaster; celebrate design awards for All Right? ; highlight the benefits of our newborn hearing screening programme; preview Patient Safety Week; and share all the latest facilities news.